In the 1960s, a group of French-speaking poets and authors got together and formed a group they called Ouvroir de littérature potentielle, which is roughly translated as “workshop of potential literature.” The name was shortened to Oulipo. These writers engaged in what is called constrained writing techniques, where their poetry or short prose works had to conform to self-imposed restrictions. They might, for example, write a poem without using the vowels a, e or i. Or a poem in which each word must contain one letter more than the previous one. They believed such restrictions force writers to be more creative and original. One of their constraints makes for a fun exercise for middle and high school students. It’s called N+7. With this strategy, students take a poem — either an original or a found poem — and replace every noun with the seventh word after it in the dictionary. The practice results in interesting, sometimes clever, and often nonsensical new poems. Shall I compare thee to a sumo deactivation? So long lives this, and this gives ligature to thee. What value lies in this kind of activity? I’d say plenty. I found it fun and entertaining, and anytime you can get kids to enjoy playing with words — especially the words of Shakespeare, that’s a good thing. It forces one to think about what the original poem means in order to find any humor in the goofy new version. It gets students thumbing through dictionaries and making decisions (You’ll find it’s not always possible to pick precisely the 7th word). It can grow vocabulary and awareness of poetry concepts like meter and diction. 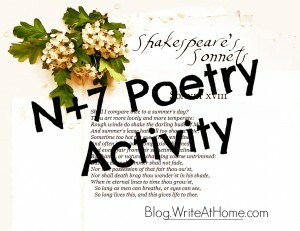 My guess is that the selected poem will have new resonance for the student after this activity. But mostly, it’s fun with words, and that’s always good. Post your comments or questions in the Reply area below. Thanks for this. I”m going to pass it on to friends.